In the previous article, I mainly examined the use of the AF Configuration Tool, which is part of the menu system of the 7D II. These cases are a very important feature when using AI Servo. 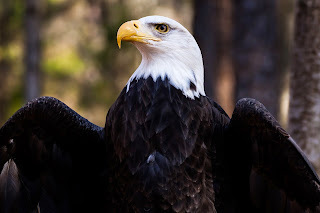 In this post, I will look at the remaining features of the 7D II's auto-focus and how they are best used for wildlife or general nature photography. Canon now supports seven options for selecting various groupings of AF points. 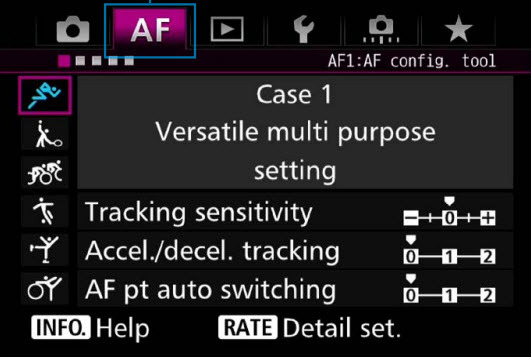 Along with these new options, the 7D II has a new AF group selection lever. This lever surrounds the joy stick on the back of the camera, but the lever has to be enabled as the group selection lever in the button settings. Below is a view of the new AF group selector switch. 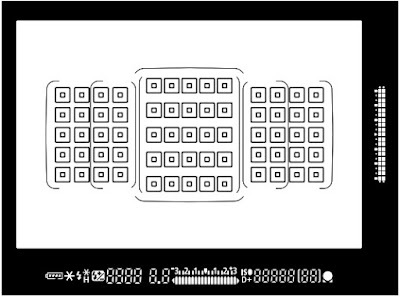 Single point spot has been around for several generations of camera bodies. You can really think of it as a more precise version of single point. In essence, it uses a very small point within the outer AF point rectangle. This is useful for photographing a subject where getting a precise part of the image in focus is very difficult . For example, if you were photographing a still bison portrait, you could use this feature to focus on the eye only and not have to worry so much about getting the eye lashes in focus. In practice, I and most other wildlife or general nature photographers do not use this feature. I am not saying it can't be used, but it has a very unique application and should not be used with AI Servo. Single point has been around since the invention of auto focus. Essentially, you just move this point around the view finder, and place it over the area you want to be in focus and half press the shutter button to focus. This is an important tool in my photography and accounts for probably 95% of my AF needs. I use this when photographing landscapes, static subjects of any kind and macro. However, most of the time I use manual focus when photographing static subjects and use live view to zoom in and focus for critical applications. Press the AF mode button on the top right of the camera body and immediately release it. This puts you in a mode to actually select and AF point. While looking through the view finder, move the joy stick on the back of the camera, and watch the AF rectangle move from point to point. Find the point which will allow the best focusing for your subject. For example, always focus on the eye when taking a portrait. It is also important to note that this is the only way to use the center AF point when using an f8 lens. It must be on the center point when using this feature. It is fine to use this mode in AI Servo continuous focus mode. This AF group was part of the original 7D and one which I find useful from time to time. I have used this successfully when photographing birds in flight, and it is one of my go to options to this day. It is good for slower moving birds and birds which are dipping into tree line. Essentially, when using this group, the center point is still the main AF point, but if the photographer gets sloppy or the subjects moves, the AF system will hand off to one of the surrounding points so the subject is kept in focus. Canon calls these extra points "assist points." Note that as you move this focus point around, you can see the surrounding points move with it. This is the same type of AF group as the 4 point expansion. The only real difference is that it contains 8 points to which it can hand off to when needed. This was not included in the original 7D, but it is one in which I may test. I could see using this mode when photographing birds against a blue sky for example. I do not think this would be a particularly good mode for mammals in a wooded area however. Note: You may also have trouble with the AF locking onto other parts of the animal that you do not want in focus. Canon literature does state that this mode resists grabbing the background inadvertently. This is an AF feature which uses 15 AF points which can be moved to essentially 9 different locations on the view finder. Zones are really best to use when you have a faster and more erratic subject. Use this when you simply cannot hold the AF point on the subject. At least it will lock on to part of the subject and with enough depth of field you will be in pretty good shape. 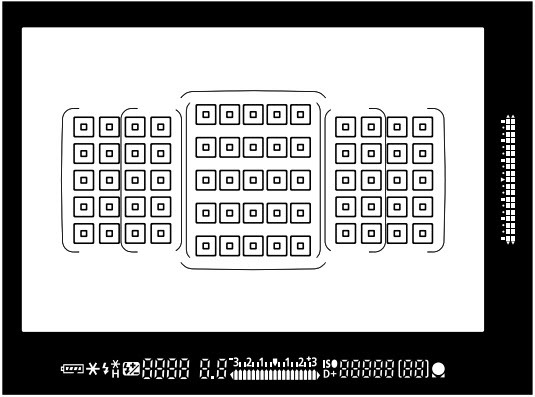 Large zone AF takes clusters of auto focus points and arranges them in three possible zones (left, center and right). Using large zone, the camera will focus automatically on the closest subject in the zone. This might be undesirable if you are in an area with many distracting objects in the foreground or at the same level as the subject. This is also new with the 7D Mark II. In this mode, the subject is determined by the entire view finder. Holding the shutter button half way down will cause AF to search for the subject and then the AF point will appear over the subject. The problem with this mode is that you are leaving the subject finding and tracking to the camera body. As you can guess this might, for example, track the foot of a bird and not his head. This mode is best used when you have a solid background such as a blue sky and depth of field is not a real issue. I use this mode when I have a ridiculously erratic subject such as a swallow or a chimney swift. Without a doubt, I recommend starting with "single point" and mastering its use. For most subjects this is going to work fine. Only use the more advanced zone features when you have no other alternative or you have a very shaky hand when shooting flight shots or rapidly moving mammals. If you are photographing very erratic subjects and you simply cannot get them in focus, try one of the group modes. I hope you enjoyed this third posting on the Canon EOS 7D Mark II! There is no doubt, that the Canon 7D Mark II's auto-focus system is a huge leap from the previous Canon 7D. In this article, I will attempt to unravel the complexity of this system by gathering expert sources as well as my own experiences with the new system. Particularly, part 1 will look at the basic configuration of the AF points and the AF cases. This, of course, will be written from a nature photographers perspective. The most obvious improvement I first noticed is the expansion from 19 AF points in the Canon 7D to 65 in the Mark II. As shown in the image below, this gives the photographer almost edge to edge AF point coverage. All 65 of these images are cross type on lenses which have an aperture of 5.6. What this amounts to is the camera uses both vertical and horizontal planes to find focus on the subject. Of course having 65 AF points, all cross type is a welcome addition, but what does this mean in practicality? If the photographer is using one of the popular Sigma and Tamron 150-600mm lenses, they cannot reliably use cross type auto focus above 400mm. At that point, the lens becomes a 6.3 lens and not a 5.6 lens. So for wildlife photographers on a budget, cross type points may not be that big of a gain. If, however, the photographer is using lenses such as the Canon EF 100-400 II or the Canon EF 400mm 5.6, they can take full advantage of the entire grid of AF points in regard to cross point functionality. The center AF point, as with most professional bodies, has two additional properties which make it very useful for the wildlife photographer. First, if the photographer is shooting at f8, the camera still maintains AF when using the center point. Secondly, if the user is using a 2.8 lens, then he can benefit from the high precision diagonal cross type. For most wildlife photographers reading this article, the high precision point, will not be an important feature as most do not own longer 2.8 lenses, but having a camera that can still reliably auto-focus at f8 is a huge advantage. With this feature, one can use a teleconverter on his 400mm 5.6 lens and effectively be able to shoot at f8, 560mm. With the 7D Mark II, Canon has introduced a new configuration tool in the menu. This tool allows the photographer to move through six different "cases" to better tailor the camera to handle certain auto-focus conditions. 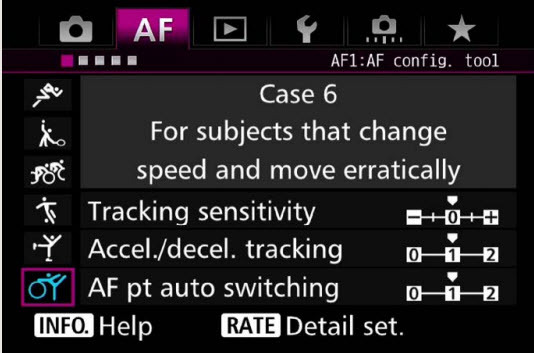 Please note, that these cases only apply to AF when you have the camera set to AI Servo. In other words this is for action shooting only. Below each case will be examined and explained. As I expected, this case is best used when I have no idea what conditions I will be shooting in. In essence, it is a general setting from which to start. This is the setting I am currently using for all my songbird setup photography. It is fast enough to handle a bird jumping from perch to perch as well as basic flight such as a slower moving great egret. 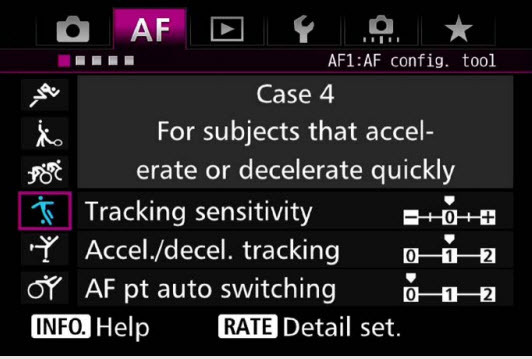 In this case, the tracking sensitivity, acceleration/deceleration tracking and AF pt auto switching are all set to 0 by default. This provides a balanced approach to shooting moving subjects. My personal feeling is to start here first and only change cases when the subject you are shooting demands the change. Use this case when you are shooting wildlife in and around other obstacles. This is often a problem when photographing birds in flight that dip down through trees or bushes. Because the tracking sensitivity, accel./decel tracking and AF pt auto switching are all set to a lower value, your auto-focus will not change focus as quickly to other obstacles in front of or behind your subject. But, it is not just birds in flight that cause this type of scenario in wildlife photography. Even photographing elk or backyard birds, sometimes it is best to not have the AF too jumpy and moving from subject to subject in the scene. Sometimes we lose focus for a second and we don't want the AF to grab the background or some tree. Case 2 is something I am currently experimenting with in my photography. This is almost the opposite of case 2. In this case, we want the AF to jump to the subject as it enters the view finder. To me, this case, is a bit too jittery for most uses. I know that there are situations out there where this might be the best solution, but I will most likely stay clear of this case for the most part. 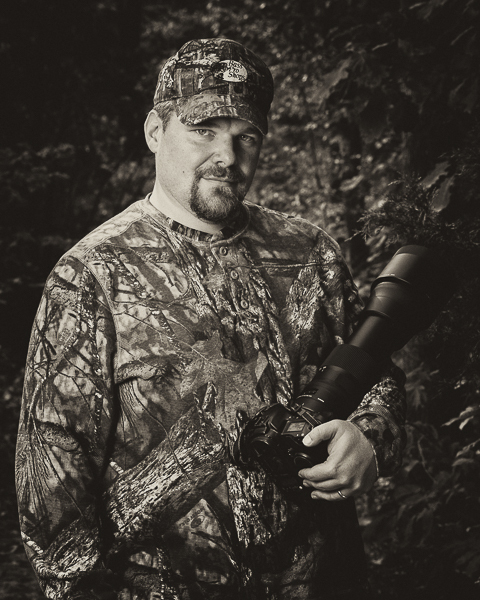 Primarily in wildlife photography, we are trying to track the subject throughout its entire movement and not changing focus from one subject to another. 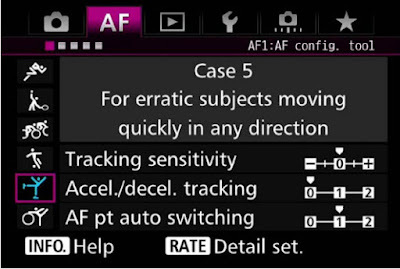 This case has souped up tracking sensitivity to force the AF to move to the new subject when it is encountered. This case might become useful in scenarios where you are tracking raptors as they turn quickly and dive for example. I could also see this being useful when tracking a predator running after its prey. I have not used this setting in the real world yet, so more to come on that in the future. This case differs from the others in that it was specifically designed by Canon to work with AF focus modes such as center point expand and zone. It increased the AF point switching so even if I were to move my tracking point off from the subject, the AF system will hand off to another point within the zone. Although I have not used this case, I could see this being something which might be effective for older or beginning photographers who might find it very difficult to hold the AF point on the subject. One concern I have with this mode, is the potential to switch points of from the subject. I may try to work with this case a later point in time, so stay tuned. Here, we have a balanced approach to extremely erratic subjects. To me this would have to be a very unusual type of subject. Canon uses the example of photographing a Kayak moving through the rapids. It is changing direction and speed constantly so this option was recommended. In the wildlife world, the only scenario I can really think of is a case where a predator is chasing its prey around in circles and has sudden shifts in direction and speed. Although this mode might be best in this scenario, I don't think I would have time to switch to this mode in time to photograph the action. I think this one has better application in the sports world. As is state earlier, I wanted to gather more information than just my own experiences or what the Canon documentation specifies. This looks like a much more radical approach to AF, but you can't argue with Art's success. My recommendation is try it and see what you think. Tracking sensitivity: Grant doesn't have one setting for all scenarios, but he adjusts it as the conditions warrant it. For example, if he notices that his lens is grabbing the background, he will turn his sensitivity down. I got the feeling, although he did not state this, that he starts out at 0. He did say that in his opinion this was the most important setting in the cases. Acceleration/Deceleration tracking: Leaves it a 0 for subjects that are moving at a standard speed. Turns it up for erratic animals. AF pt auto-switching - I got the feeling from his thoughts on this that he didn't use this too much. Grant was definitely not someone who seemed to not have a "set it and forget it" attitude when it comes to auto focus settings. I did find his videos informative, but I thought that he was largely just regurgitating Canon's literature. I thought that these three photographers give us a good cross section of what the pros are doing out there when it comes to the AF cases. I hope you enjoyed this article on the Canon EOS 7D Mark II's AF. In part 2, I will examine the various AF modes and when to use them. FORSYTH COUNTY, NC - Last year seemed to go by so quickly. I spent many months dealing with what the doctors believe is a failing gallbladder. Even so, I did get out now and again to make some photographs. Although I do not think 2017 was one of my best years, it did provide some images I am proud of. As is my tradition, here are my top ten images of 2017. I hope you enjoy viewing them as much as I enjoyed making them. If I had to characterize this year, I would call it the year of the portrait. Let's switch it up from last year's and count them backward from 10 to 1. I like this image because it takes a common species we all have in our own backyards and adds a little color and interest with the log perch flanked by moss. 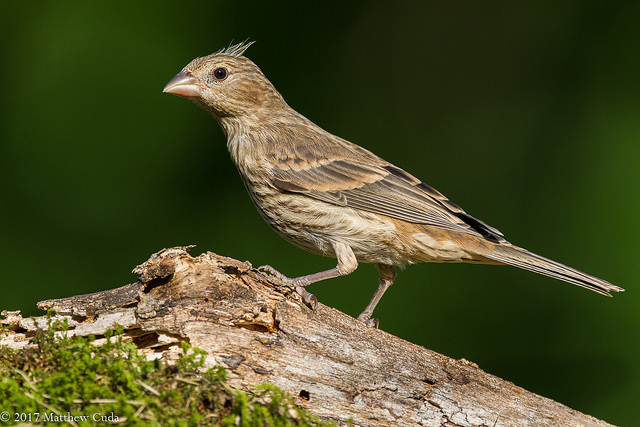 The curvature of the log also parallels the finch's posture. This image also shows what is possible with the older Canon 7D (classic). I have always wanted to see just how close I could get to a bird of prey and provide a portrait that is in your face. This was the resulting image. 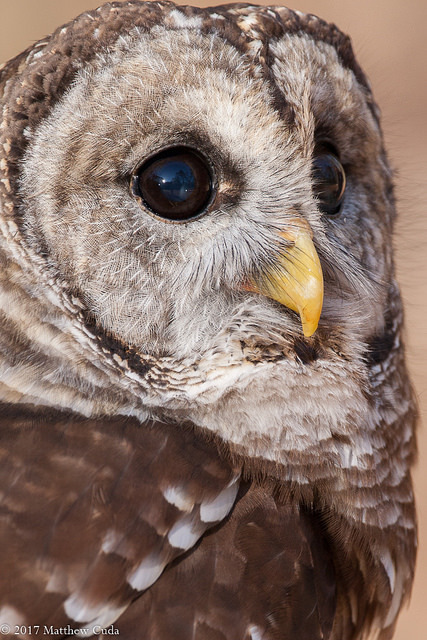 I like how the viewer can see every feather of his facial disk, and the large eyes of the barred owl. It is slightly "over the shoulder" with a 3/4 view. 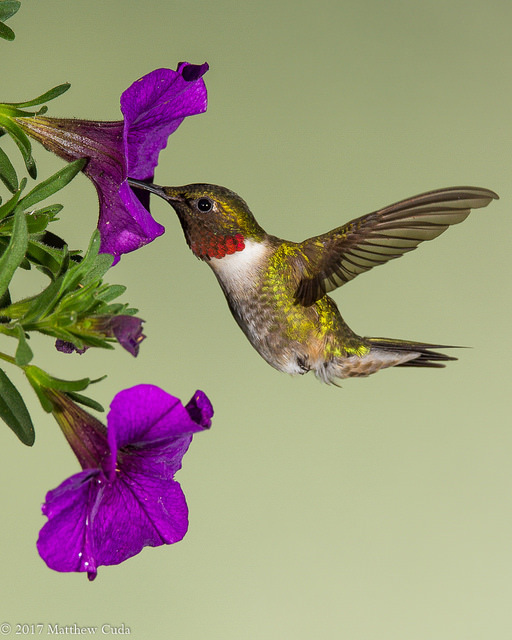 This shot was taken with the Canon 1D Mark III and the Sigma 150-600mm lens. 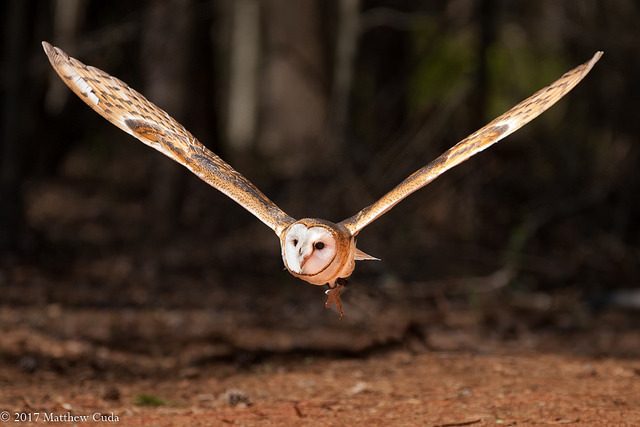 The barn owl is somewhat unique in that it flies almost silently and very close to the ground. Here, I am on one knee and waiting for the owl to dip down to the ground. I use the zone focusing technique here, and hold the shutter button down as the bird approaches. I let him fly into my zone of focus instead of focusing on him directly. 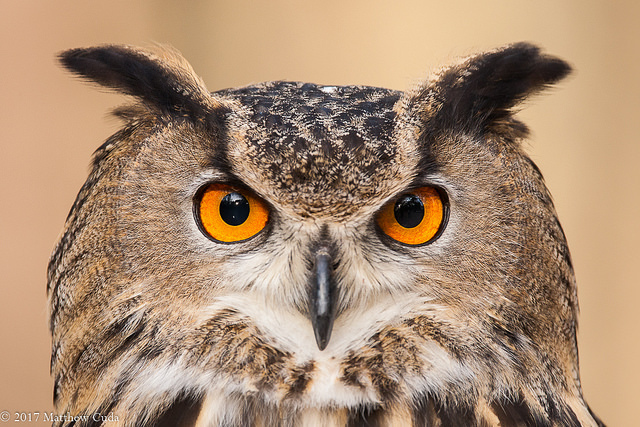 This shot was taken with the Canon 1D Mark III and the Sigma 150-600mm lens. I really like this shot overall, but I placed it at number seven, because I do not like the fact I used my Christmas tree top as a perch. Yeah, I know, kinda corny. This snow storm caught me a bit off guard, and so I used what I had close for the perch. 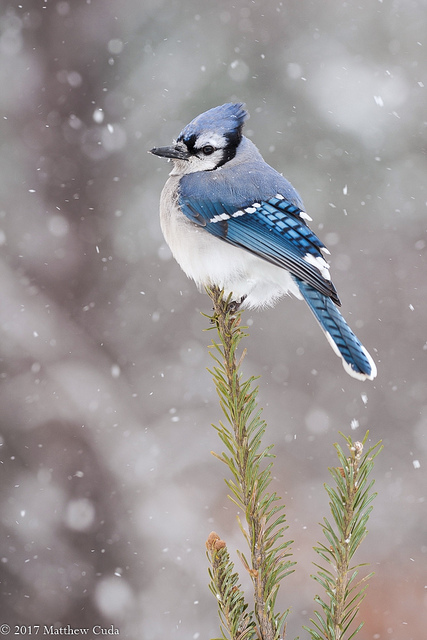 Other than that, I really like the heavy snow in the scene and how comfortable the blue jay appears perched on the tree top. Had I not used a Christmas tree, this might have made #2. This shot was taken with my Canon 1D Mark III and Sigma 150-600mm lens. I have done very little nest photography, but it is something that has been on my list for a while. I noticed this American robins nest on my property, and decided to take some shots of the little guys. 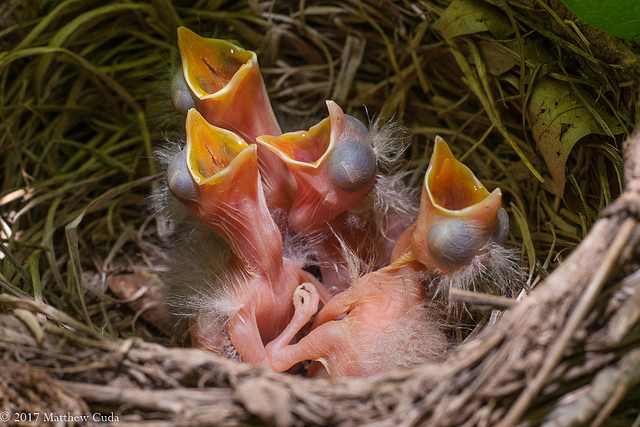 I like this shot because all the nestlings have their mouths open, ready for mama robin to return. I also like the detail in their bodies. This image was shot with my Canon 1D Mark II, EF 50mm 1.8 lens and an extension tube. Lighting was provided by a fill flash and natural light. This is a shot that had been on my mental shot list for some time. I wanted a symmetrical shot of an owl as he looked into my lens. The depth of field is so shallow here that only the eye and part of the facial disk is in focus. This image was taken with my Canon 1D Mark III and Sigma 150-600mm lens. You almost couldn't ask for a better setup shot than this. 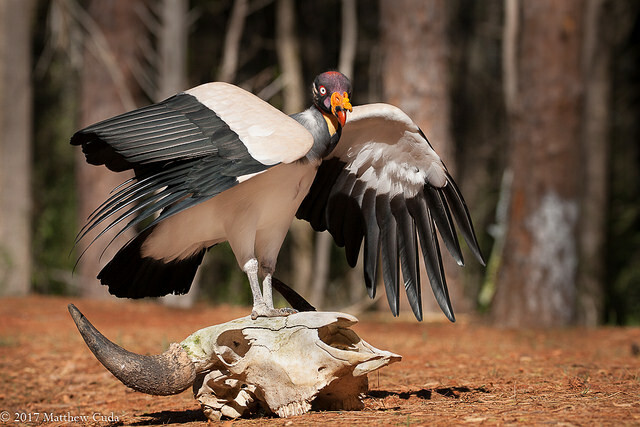 At PhotoWild, a trained king vulture on queue would jump up on this skull and wait for his picture to be made. My only regret are all the trees in the background. The trees really distracted from the subject. The other issue is the ground was actually sloping in different directions which made it hard to make level. I got down in a prone position to make this shot with my Canon 1D Mark III and the Sigma 150-600mm. Many years ago, when I first started on this journey of wildlife photography, I read a book by Leonard Rhue called "How I Photography Wildlife and Nature." This was the book that first supercharged me into wildlife photography. 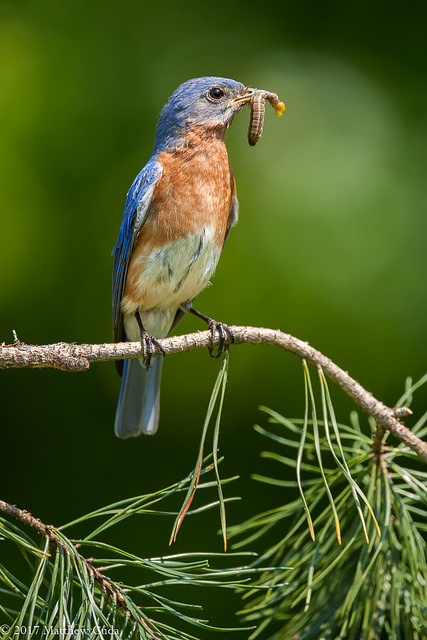 One of the images in that book was of an eastern bluebird with an insect in his mouth. From that time on, this is one I have longed to get, and finally in 2017, it happened. I will continue to hone this shot, if possible, and make it better. This images was made with my Canon 1D Mark III and the Sigma 150-600mm lens. This is a shot that I wasn't in love with immediately. Don't get me wrong, I like the shot, but as it grew in popularity, I took a second look at it. The appeal is really a universal appeal among humans and animals. You see almost every species of animal yawns. 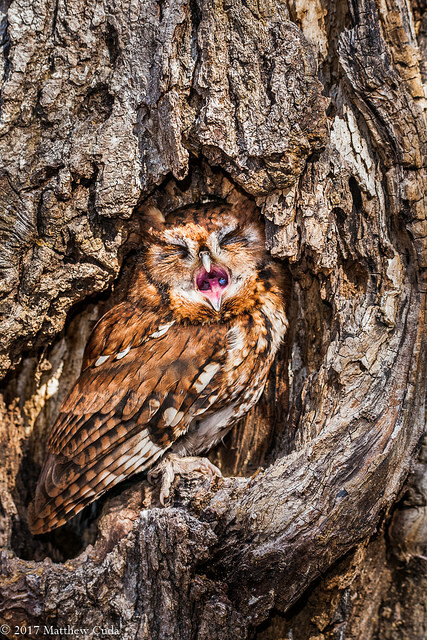 This image was featured in Europe, and won 2nd in Wildlife Magazine's contest here in NC. This shot was made with my Canon 1D Mark III and my Sigma 150-600mm lens. Every year, in late May and June, I add to my lifetime project simply entitled: "The Hummingbird Project." Hummingbirds are the most amazing animals that God put on this earth. Nothing else compares! Each year, I try to "take it up a notch" by trying new techniques and presenting the hummingbird with a more artistic flair. This is a three flash setup shot with 2 flashes on the subject and one on the background. I used the Canon 7D with my Sigma 150-600mm lens. Well, that's all for 2017 and I thank God for giving me another year on planet earth. Thank you for taking the time once again to read the newsletter and I hope you like my best of from last year. This is a great exercise for all of us to do as it helps us to find our strengths and identify our weaknesses in our own photography. I hope you have a wonderful year in 2018. If you are on this email list then you have either signed up for my newsletter or you have expressed interesting in doing business with me in the future. This newsletter represents much of my latest work and is a great way to be the first to purchase my images and story ideas. Although I would hate to see you go, you are welcome to unsubscribe using the link below. Yesterday I learned of something which frankly was astounding, and I think in some ways despicable. While checking out the blog of Art Morris, I learned that Canon had "fired" Art from the Explorers of Light Program. For those that do not know, the EOL program is an honorary position given to the best photographers in each of their respective genres. They receive benefits such as paid speaking engagements, shooting training videos for Canon, and they are able to test the latest equipment. If you have followed Art's work over the years, you know that Art has always stuck by Canon through thick and thin. I often joked that Art had never seen Canon product he didn't like. Art, along with Moose Peterson, were "go to" photographers for me as I began my journey many years ago as a nature photographer. If it were not for them, I doubt I would be the bird photographer I have become. I don't say that to brag on me, but on them! Art characterized the firing on his blog: "About three or four years ago, Steven Inglima called me. Steve never called me. He was going on and on about nothing and suddenly it dawned on me: I was being let go as an Explorer. And that’s what happened. As a result of political [nonsense] at Canon. Steve fought hard to keep me in the program. In about a year he was fired too. He did get one concession. I, and the other photographers who were let go, were OKed to use the title Canon Explorer of Light Emeritus." I can only speculate as to the reason behind the firing, but I don't think we have to look to hard to figure out what might have been the cause. I will leave that up to you and not speak more on that topic. It is sad when anyone is fired, but someone with such great photography and teaching skills and dedication to Canon should have never been let go.